Dress up in a good mood! 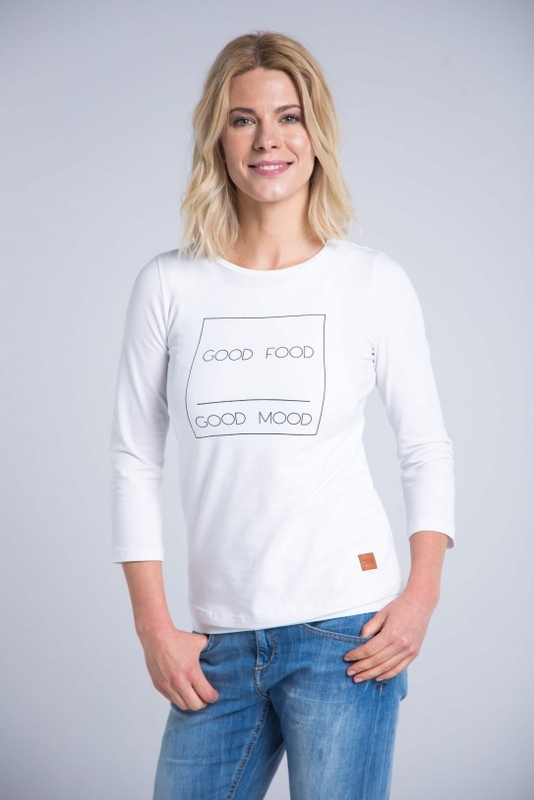 Good Food / Good Mood Feeding T-shirt is intended for moms who are looking for comfort and elegance. For moms who look at the world, filled with optimism and take it with a pinch of salt. The T-shirt, made of high quality knitwear, is pleasant to the touch - you will appreciate it alongside with your toddler, who at the time of feeding will be able to cuddle in the delicate material full of your fragrance. Good food puts you in a good mood - it's a known fact not from today. Show it to everyone by dressing up in this unique T-shirt. Mamatu Good Mood is designed to give each mom comfort and discretion during breastfeeding. You do not have to worry anymore when your toddler gets hungry during a stroll. The special t-shirt design allows for discrete lifting of one layer of fabric, eliminating the need to completely undress. The Good Feeding T-shirt, thanks to its light color, goes well with both light and dark colors. With ease, you can put it on together with classic long navy blue jeans or ,trendy in recent years, ragged trousers. You can also successfully wear it with knitted shorts such as the fashionable pineapple shorts from our offer. Check out the benefits of our Good Mood Feeding longsleeve! comfortable and discreet - it does not look like regular breastfeeding clothing. You can wear it even after the baby has finished feeding. Distinctive graphics - The sign Good Food / Good Mood, which will put you in a perfect mood. Nursing t-shirts were designed for the kid's closeness and mum's intimacy. Double-layered t-shirt gives maximal comfort, but does not reveal evidently its functionality, which makes it very universal.